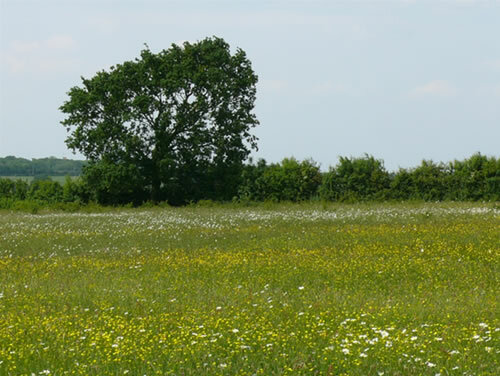 How many wild flower meadows will your Grandchildren see ? A lot fewer than your Grandparents did ! 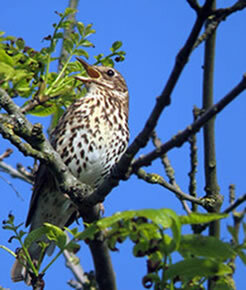 Can't you see a little glade in your garden, just humming with life ? It's so easy too, Nature's the gardener ! 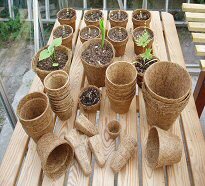 It's so easy with Nature's help, clear about three square yards of soil ( rough stuff will do) sow the seeds, water and wait. Nobody really knows what's causing our bees to decline, nobody really knows why so many of our wild birds are declining either, or our butterflies come to that ! In fact I think nobody really knows an awful lot about an awful lot of important things. Well, I do think I know one thing. Nature has been around much, much longer than we have - so perhaps it may be a good idea to take a look at what she has been doing all of this time. You know all that time before we came along and 'helped'. 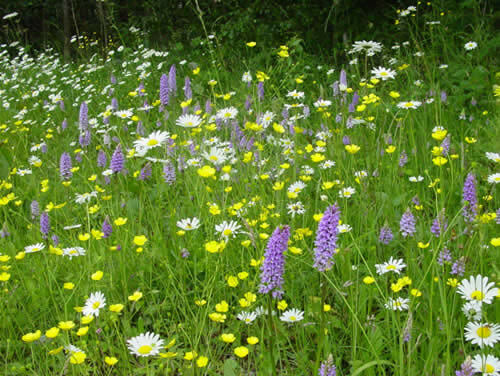 How about looking at wild flowers for example, well these are in decline too. Do you think that all these other "declines" are just a coincidence ? Well maybe, but just I don't think so. For all of those countless years wild flowers nurtured the insects and produced the seeds which fed the birds, and gave the pollen to the butterflies and bees ( seen a very disappointed bee on a hybrid lately ) and generally looked beautiful while life got on around them. Or was it that life got on because of them ? Well, O.K. I know it's not likely that you have a meadow to plant, we certainly don't. But how many little plots in our gardens can be put together, make the biggest meadow in the world ? Can you imagine what that would do for the wild life in this country, a mini wild flower meadow everywhere a bee hovers, or a wild bird feeds ? We've been banging on for years about the importance of wild flowers. A bit of a bank, perhaps a boggy bit, or around where the shed is - almost anywhere could be ideal. Nature's flowers aren't as fussy as all them, near sterile, hybrids ! 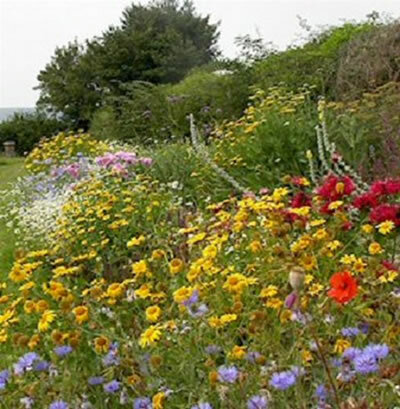 How about a simple easy way to create a wild flower garden ? A wild flower garden which will be helped through all those droughts we are warned about by another of Nature's age old organisms - Mycorrhiza. We have a of sachet seeds of all sorts of wild flowers, just perfect for a 'garden' meadow. "What wild flowers are these then ? ...... I have plenty of Rosebay Willow herb and the like ! " Well here they are, each packet has seeds for these wild flowers. "When the Bees go - we go"
Let's help them stay around ! Let's plant the country with 'Garden Meadows'. 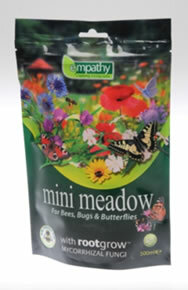 Just a 'meadow' of the 3 square yards that these packets of Mycorrhiza 'boosted' wild flower seeds will give you. Then let Nature do what it has always done without us interfering, just keeping that old, essential 'Natural Cycle' going around, around, and then around again. 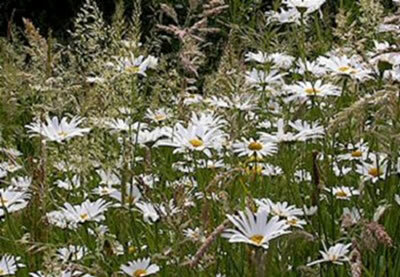 Like the Birds and the Bees will be in your 'Mini Meadow'. Postage is £3.95. If it's actually less though, we refund the difference !